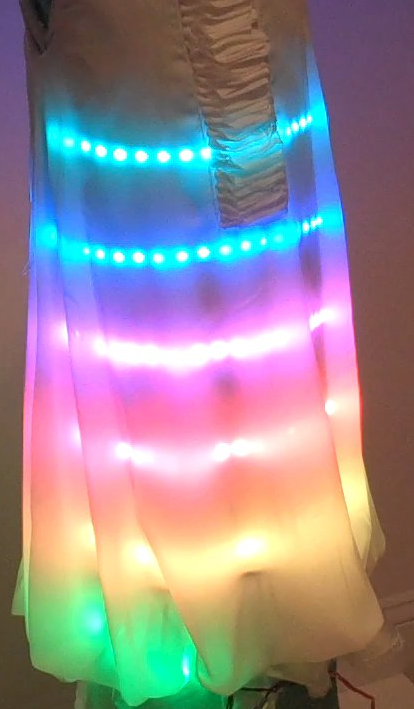 Halloween LED dress inspired by Katy Perry #WearableWednesday « Adafruit Industries – Makers, hackers, artists, designers and engineers! Thanks so much to Scott for sending in this adorable Halloween project! Check out more here. 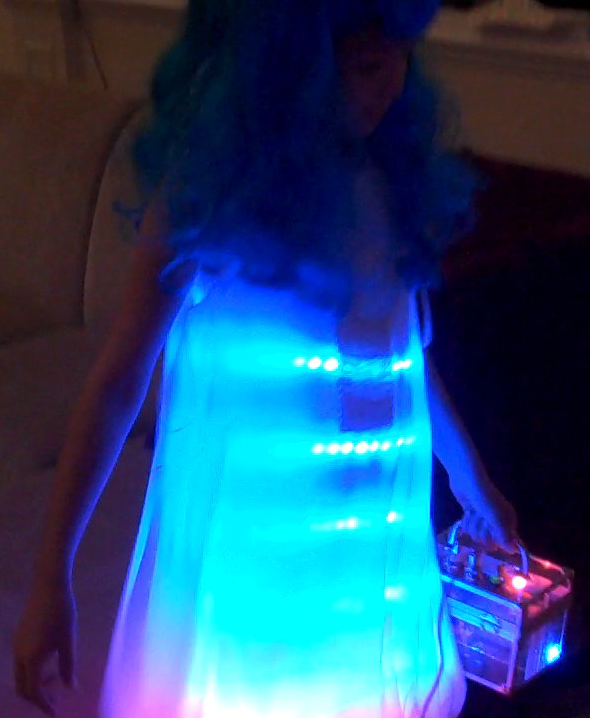 When I asked my daughter what she wanted to be on Halloween she said she wanted to have an LED dress like Katy Perry. After some discussion, it seemed that we’d need a white dress that both diffused but didn’t block too much of the light from LEDs underneath. We’d need some way to mount the LEDs without needing to alter the dress itself (since we planned to use it for other occasions). So we focused on getting a light colored slip she could wear underneath on which the LEDs would be attached. To complement the outfit, she wanted a blue wig. The dress, slip, and wig we used were: White Chiffon Dress (~$30) White Slip (~$15) Blue Wig (~$15) The next part of the design was to decide on the best way to place LEDs. We wanted to have a broad range of effects so we decided to use RGB LEDs (with embedded controller chips). We decided to use a full 4-meter reel of 60 LED/meter NeoPixel RGB LED Weatherproof Strip backed with a white-color flex PCB from Adafruit. We decided the best way to mount the strip was in a spiral around the slip using loops to hold it in place. This is where a dress dummy would have really come in handy. Lacking one, we picked up a couple rolls of bubble wrap at Home Depot. The bubble wrap we chose was in a roll 2 feet tall and very close to my daughter’s measurements. We actually bought two rolls so it would be 4 feet tall and duct-taped them together. Later a single roll was used as a lightweight way to transport and display the dress. To form the loops to hold the LEDs we wanted something strong enough but translucent. We chose 1.5 inch wide white organdy ribbon from a local JoAnn’s Fabric store. Once we had situated the LED ribbon in a spiral that we liked around the slip (when mounted on the bubble wrap roll) — we marked off where 4 lines of loops would need to be sewed onto the slip (down the front, back, and both sides). We then removed the LED ribbon from the slip to begin the sewing. We tried a couple ways to cut down on the sewing but neither was effective. Fabric cement wouldn’t hold on those materials. A Singer button magic did help in holding the strips in place but ultimately sewing was required. 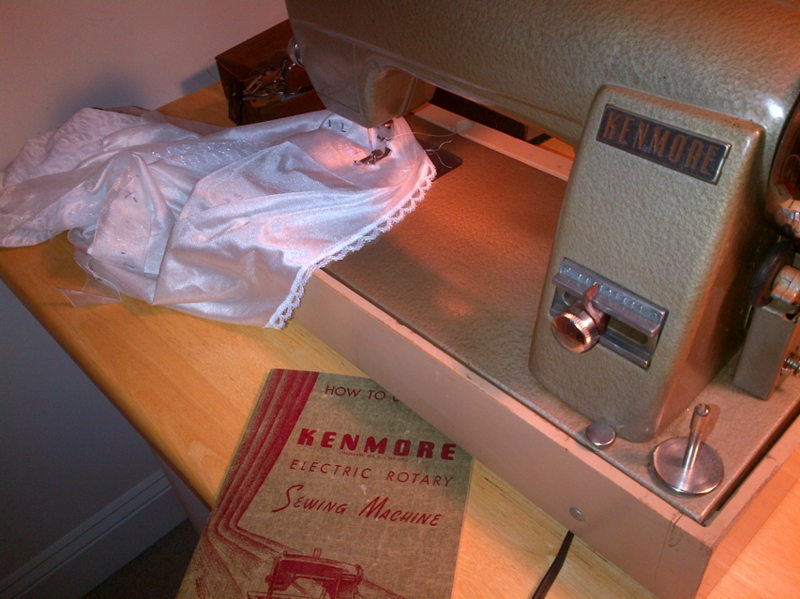 I located an old 1950′s sewing machine we had in a closet and used that to sew the ribbon to the slip at the ~24 attachment points. We returned the slip to the roll of bubble wrap and carefully threaded the LED strip in a spiral through the loops. This worked pretty well but ultimately it was helpful to finish with some hand stitching at a few points along the side to ensure that the strip was clamped tightly and wouldn’t start sliding through the loops. After that point, we never needed to unthread the strip. Our daughter was able to put the slip on herself — essentially gathering together the concentric rings of the spiral and either stepping into it or putting it over her head. That brings us to the electronics and software. My daughter wanted to wear the costume to her school’s Halloween parade, to her piano recital (done in costume for residents at a local retirement home), and for Halloween itself. One challenge was figuring out where to house the battery and electronics. The costume needed enough power to operate the 240 LEDs for a couple hours. I usually use 6-cell NIMH battery packs which have enough capacity (5000 mAh) for the power requirements but wouldn’t really be light enough to put on the dress itself. So the thought was to use something else she would carry to contain the electronics. For her first two events, I came up with the idea of creating a sort of glowing purse that lighted up in sync with the dress. And for Halloween itself, it was natural to use her pumpkin-shaped treat bucket to carry the electronics as well as some candy. So we wanted a design where the electronics/battery could be swapped between two different carriers. Each container would have 3 elements: a power switch, a connector to the dress, and a backlit selection button to change modes on the dress. Read the full build here! 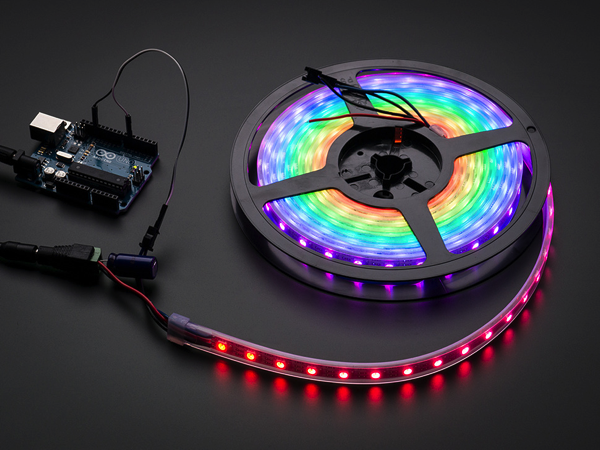 Adafruit NeoPixel Digital RGB LED Strip – White 60 LED: You thought it couldn’t get better than our world-famous 32-LED-per-meter Digital LED strip but we will prove you wrong! You wanted twice the LEDs? We got it (well, its 1.875 times as many but that’s within a margin of error). You wanted thinner strips? Now only 12.5 mm wide, 10 mm if you remove the strip from the casing. You wanted less noticable strip color – this strip has white-colored flex PCB, which will be less visible against white-painted walls. This is the strip with white flex PCB, its identical to the black 60 LED/meter except it has a different color mask on the flex strip. Read more. 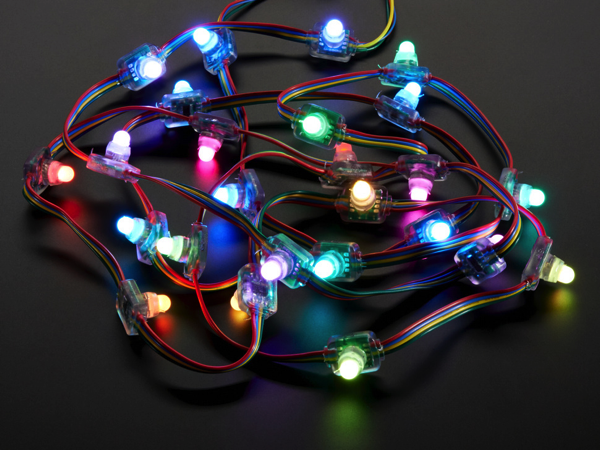 12mm Diffused Flat Digital RGB LED Pixels (Strand of 25): RGB Pixels are digitally-controllable lights you can set to any color, or animate. Each RGB LED and controller chip is molded into a ‘dot’ of silicone. The dots are weatherproof and rugged. There are four flanges molded in so that you can ‘push’ them into a 12mm drill hole in any material up to 1.5mm/0.06″ thick. They’re typically used to make outdoor signs. These pixels have a flat square back, we also have pixels that are long and thin, both are the same electronics, just different shapes! Read more.